One more from the recent Mammoth trip. This one falls under the category of hard to miss getting an interesting if you're willing to hike a bit. Click above to see much larger. The photo was taken on the Duck Pass Trail, about a half-mile below the pass. The view is straight down to the Barney Lakes and, in the distance, Skelton Lake. At the end of the valley is Mammoth Mountain. Look close and you can see the ski runs. In interest of self-improvement and photographic criticism, I may have cropped this one a little too tight at the bottom (to get ride of some rocks in the foreground). It probably would have been a little easier to get away with the crop if the sky was a little more interesting -- one of those days in which I really needed more puffy clouds. Still a pretty nice view. I took the photo with my Nikon D5100 with my Nikon 10-24mm wide-angle lens, which delivers super crisp images. How crisp? Look at a much larger view. To get to the trail from town, take Lake Mary Road. Go past Twin Lakes and turn left on the Lake Mary Loop Road. Left at the entrance to Coldwater Campground and drive to the trailhead parking lot at the end of the road. There are two trails -- one to Emerald Lake, the other to Duck Pass -- which is the second one. 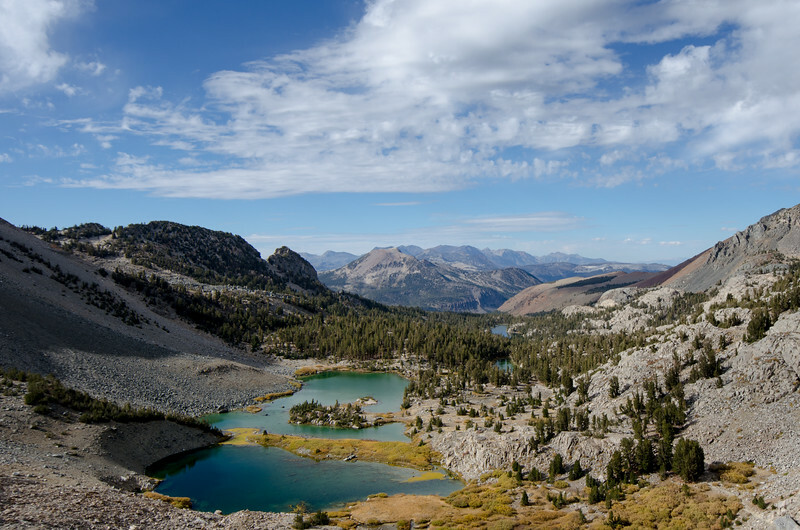 It's about a five-mile hike to the pass, which also offers great views of Duck Lake, Pika Lake and the Silver Divide.